JEGS crate engines are reverse engineered to create a product that has better than new quality. Reverse engineering allows any factory original defect to be found and removed; saving you time and money by keeping your vehicle out of the shop and on the road. Engines are factory checked after assembly to ensure proper operation. JEGS crate engines feature a 36 month/unlimited mileage warranty. This engine was designed as a direct replacement for 1996-2000 Chevy & GMC pickups, SUV's, and van applications. These vehicles introduced the L31 5.7L small block featuring Vortec cylinder heads that were developed for maximum power and efficiency. 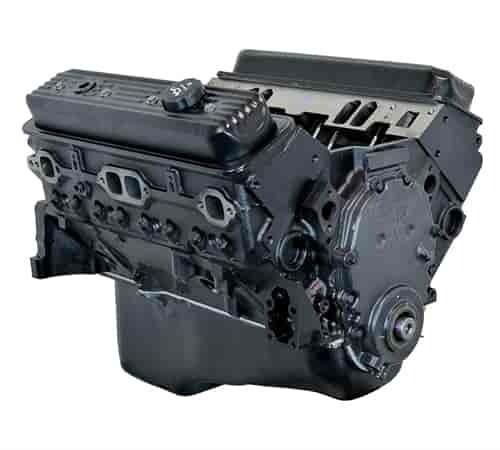 Producing up to 255 hp in factory spec, this engine can also be retrofitted into an older car with a performance carburetor to produce up to 290 hp. *Carbureted engine was tested using a performance dual plane intake manifold, 670 cfm carburetor, and an HEI distributor. Rods: OE reman powder metal 5.7 in. Cam Lift: Intake 0.414 in. / Exhaust 0.428 in. Notes: Does not have mechanical fuel pump provisions. Does JEGS 0282 fit your vehicle? 0282 is rated 4.0 out of 5 by 1. Rated 4 out of 5 by joe shadetree from 99 Chevy K1500 Suburban "Motor not ready to run" Had a couple of minor issues as to why 4 stars, Jegs and ATK customer service are excellent and helped every way they could. I recommend checking compression on all cylinders, verifying top dead center on #1 cylinder and lash on valves prior to install. Mine arrived with zero compression on #1, backed off 3/4 turn and got 170. 180 degrees out on timing but by doing compression check you'll find it easy to adjust. Call ATK for their break in procedure or download from web it is a little different than Jegs. Other than that started right up and hoping for another 273k miles out of her. This will be a 4 quart pan + oil filter. Yes, this would be the correct engine to use for your Tahoe. Are these heads able to accept 1.6 roller rockers without modification? I&rsquo;m trying to get a little more lift out of the cam, but want to make sure the pushrods won&rsquo;t rub on the cylinder heads. Yes, you should be able to use 1.6 rockers arms, check all clearance after installation. What are the head and cam specs? I am looking for the size of the runners in the heads. Are these new or re-manufactured blocks and parts? If i use this in place of a 305 will i have to replace the computer?? and the injectors??? These are remanufactured engines. If you are using a TBI EFI system you will need to retune the engine. These engines are assembled and components cannot be changed. why is this not emissions legal?! if connected to an 2000 express 1500 vortec motor with headers short ram intake and chip tuned ? THis engine has not been tested in all locations for emission legality. You can talk with your authority in your location to verify whether it will work or not. is this motor for a 96-2000 truck? Yes, this is designed for use in 1996-2000 GM trucks.